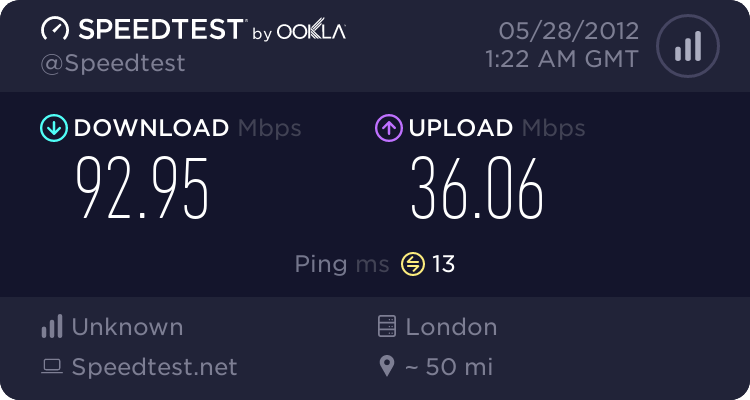 It seems I have the chance to get access via the Quickline wireless access for my internet has anyone had experience of their service,here in Lincolnshire the possibility of getting decent adsl via wires seems still to be at least a year away. I'd suggest asking them. They have all the information necessary to give to the correct answer whereas we here do not. It depends on so many factors that people here will not know about unless they work for the company...like type of antenna, radiation pattern, etc. There is no inherent reason why a wireless link won't work over 10 miles, provided that you really have a line of sight to the tower block. Still, assuming that Quickline operate in the 5 GHz band you will need a minimum clearance of 20 metres over any intervening buildings or trees to keep the Fresnel zone free of interference. This would be considerably larger for the 2.4 GHz band. The main problem is that they may be reluctant to install a point to point link (which is likely to be necessary over this distance) for 1 customer. If some of your neighbours are interested you could offer to host a repeater station so that the point to point link serves a group of customers. The point to point link would require a Ubiquiti Nanobeam at each end costing about £80 per unit. 10 miles clear line of sight is no problem at all, assuming the aerial the other end is a high gain sector, correctly elevation aligned and more importantly, facing your direction. They can use a higher gain aerial at your property if needed, however these are more expensive than the standard small dish / integrated units . If they have engineered it properly you will not regret moving away from the BT line. Ask if they support VoIP too, if they have done it right then the answer will be yes. Then you can throw away the ~£16 BT line rental, say hello to genuine cheap calls and say goodbye to connection/min call charges, inflexible features and your number being sold on to marketing companies repeatedly! We use www.voipfone.co.uk as do many of our home and business customers and recommend them highly. Or just read their website as a lot of answers are on there already.